The HAIRRYs celebrates fabulous hair and the people who have it. Today we celebrate the best hair in college football! We’ve scanned every quarterback and “head” coach (see what we did there?) to find the best hair on the field! How did we determine our winners? For some conferences, determining the winners was super easy. All we had to do was find the coach with the most hair. For other conferences, we had to take things a bit further. 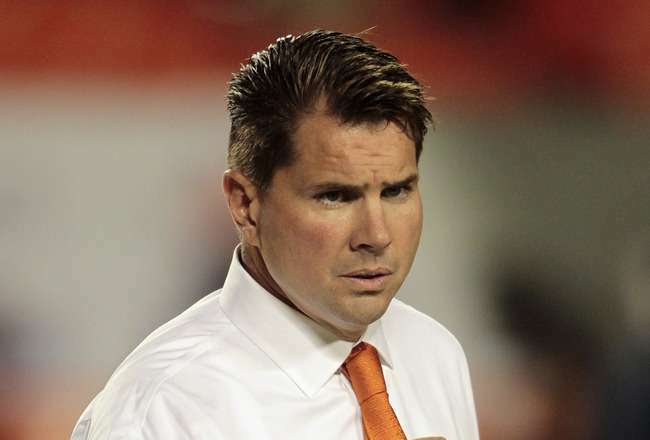 Some Miami Hurricanes fans don’t love Al Golden as their head coach. They think he should win more? But we don’t understand. His hair is already winning — in fact, it’s undefeated! Golden grew his dashing brown locks to the perfect length and keeps them in line, spreading out from the front. That sounds like smart offensive play! In Tennessee, the nights seem darker. The sun shines a little less brighter, and Vols fans just don’t smile as much anymore. Why? Because Nathan Peterman’s hair transferred to Pittsburgh! Peterman earned the starting job for the Panthers, and we know why — because of his hair! This graduate student knows how to keep it short and simple. His hair is very thick with just the right amount of ‘tussle.’ That’s not the only ‘tussle’ happening around Peterman’s hair. We hear the ladies of Pittsburgh keep fighting for the right to run their fingers through it. We wish them luck, because Peterman’s offensive line works hard to keep all hands of this prized QB! 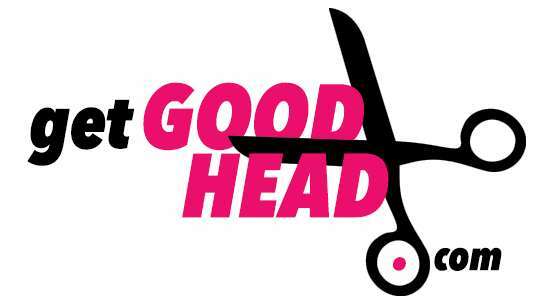 Sunny South Florida seems to know something about good hair! We couldn’t leave the ACC without giving some credit to the Hurricanes’ QB. 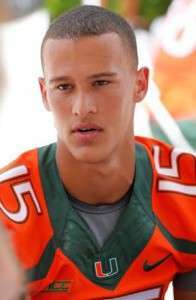 Brad Kaaya clearly spends some Q-T perfecting what goes under this Q-B’s helmet. Kaaya understands that it’s important to look sharp no matter how hard you’re sweating. That’s why he has a tight fade on the sides with the perfect length on top. Whether he’s fresh off the field or fresh out of bed, we imagine Kaaya’s hair shines as brightly as the Miami sunshine. Checkout the most popular men’s shampoo, by clicking here! The Oscar — uh — we mean, HAIRRY goes to… Ryan Gosling! Wait. No. 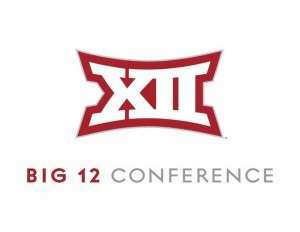 We mean Kliff Kingsbury! This is so confusing. They’re the same person, right? I mean, just look at Ryan Kliff’s hair! It’s ready for a Hollywood movie set. It’s perfectly swooped to the side as if a team of hair and makeup people perfectly placed every strand. 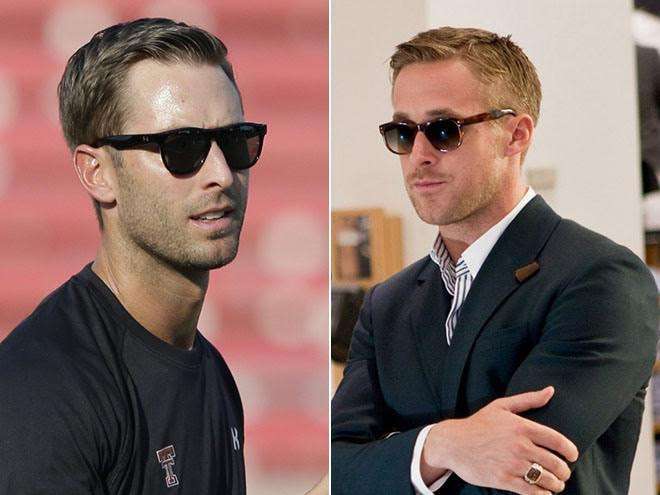 Kliff also has a million dollar smile and some slick SoCal shades which also add to the Ryan Gosling-esque persona. However, we’re concentrating on his hair. Coach Kingsbury’s hair lies on that magical line between blonde and brown. He also understands how to use the right product — and the right amount of product — to lock-in his locks for 4 quarters. Ryan, we mean, Kliff, will you please spill your secrets? How DO you achieve this Hollywood hair!? Did GQ fly to Iowa to snap this photo of Sam Richardson’s hair? 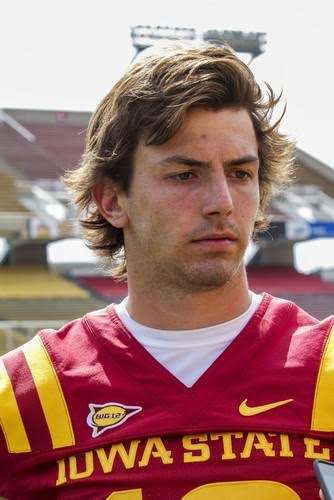 The Cyclones’ quarterback evidently understands that the ladies love long hair. In fact, we bet he spends some serious time achieving the look of just-took-off-my-helmet-and-my-hair-still-looks-perfect. Or maybe he just actually took his helmet off? Either way, we’re big fans! On the field, Iowa State isn’t having the best season so far, but no one should blame Sam’s hair. It has helped this QB throw for more than 800 yards while his hair throws golden rays to everyone whose lucky enough to gaze upon it. That’s the problem though. Most of the time, when the TV cameras point toward Sam’s hair — their view is blocked by an Iowa State helmet. Can helmets be optional in football from now on? …no? That’s dangerous? Okay, we’ll just have to wait — 4 whole quarters for another glimpse of this award-winning hair. 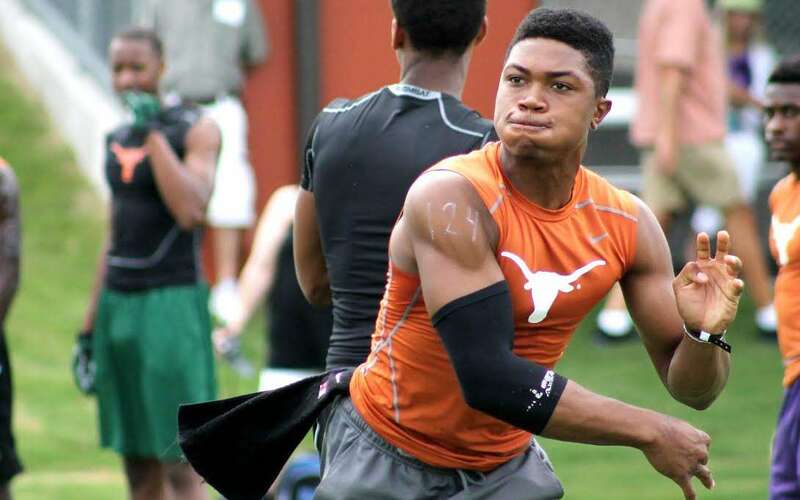 Everything’s bigger in Texas — even Jerrod Heard’s hair! Heard seems to have taken to the motto, “the higher the hair, the closer to God.” He’s taken some time to grow his hair long on top, and that also means he takes time to keep it looking sharp. 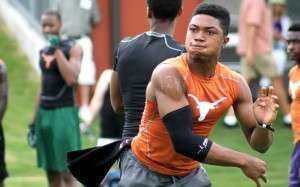 Granted, Texas isn’t the football powerhouse it has been in years part, but Heard (and his hair) are working hard to change that! 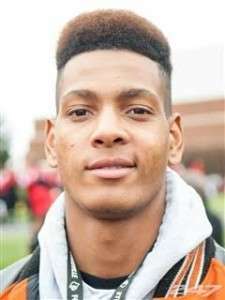 The Longhorns’ head coach has even taken notice of Heard’s swagger on the field (and on top of his head) when he told reporters, “He’s got a ton of personality. He’s got that arrogance about him, which is fine.” Indeed, Jerrod’s hair is fine and worthy of a HAIRRY! “I’m a pro!” That’s what Jim Harbaugh’s hair shouts into the microphone during every press conference. Granted, Harbaugh was a pro.. having coached for the San Francisco 49ers. 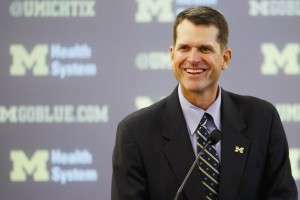 But now, the college game is lucky to have Harbaugh’s hair. The Michigan head coach embraces his age (and his slightly receding hairline). That actually earns some bonus points in our playbook — knowing what you’ve got and knowing how to work it! 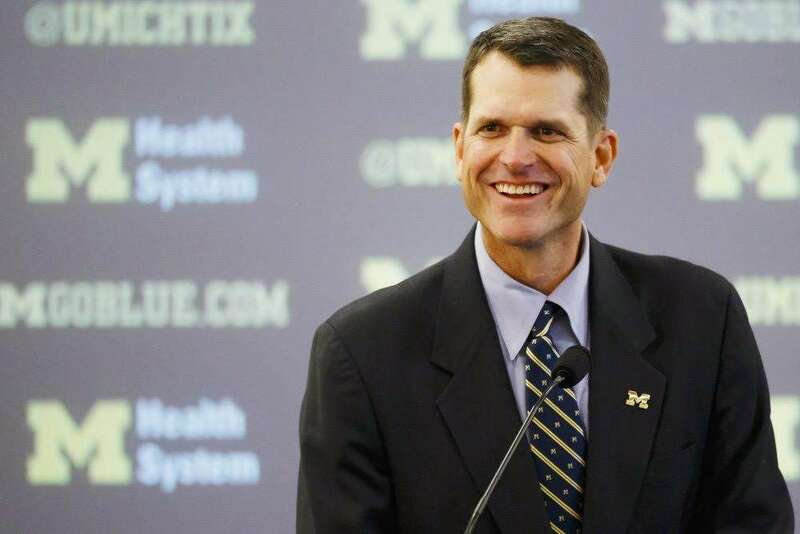 Harbaugh masters both by allowing the gray hairs to creep in and by keeping it all short and tight. Harbaugh can be somewhat of a “hot head,” and we couldn’t agree more. That’s one hot head of hair! 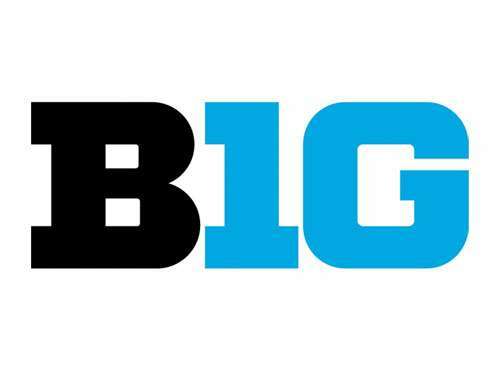 Now we’ll see if his Wolverines can heat up the Big 10 as much as Harbaugh’s hair. 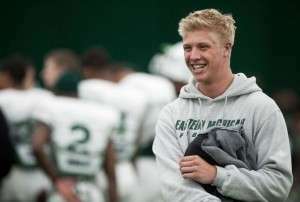 ESPN recently wrote that Wisconsin’s Joel Stave is “a quarterback who has never looked better.” ESPN, we couldn’t agree more! 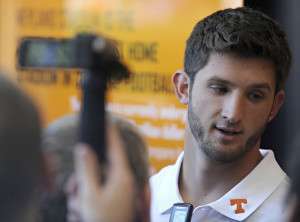 Stave’s hair reminds the Get Good Head team of Chris Hemsworth in Thor, and who wouldn’t want to be compared to that!? 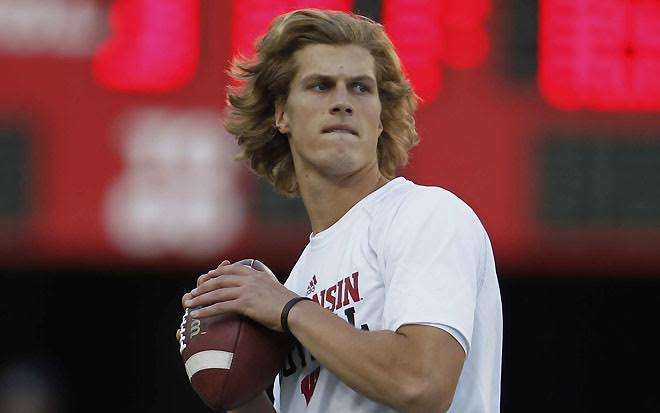 Stave grew his blonde locks almost as long as he can throw the ball — LONG! We love it. What we don’t know is how he manages to pack so much good-looking hair under that helmet? Did they have to remove the padding so all of that hair could fit? Did the Badgers special order a helmet just for Stave’s hair? We’ll research that, but until we get the answer — just know that this QB gives plenty of TLC to what’s up top. Keep going long, Stave, we dig it. And in this picture, Connor even wanted to make sure Get Good Head noticed his perfect hair by pointing to it! 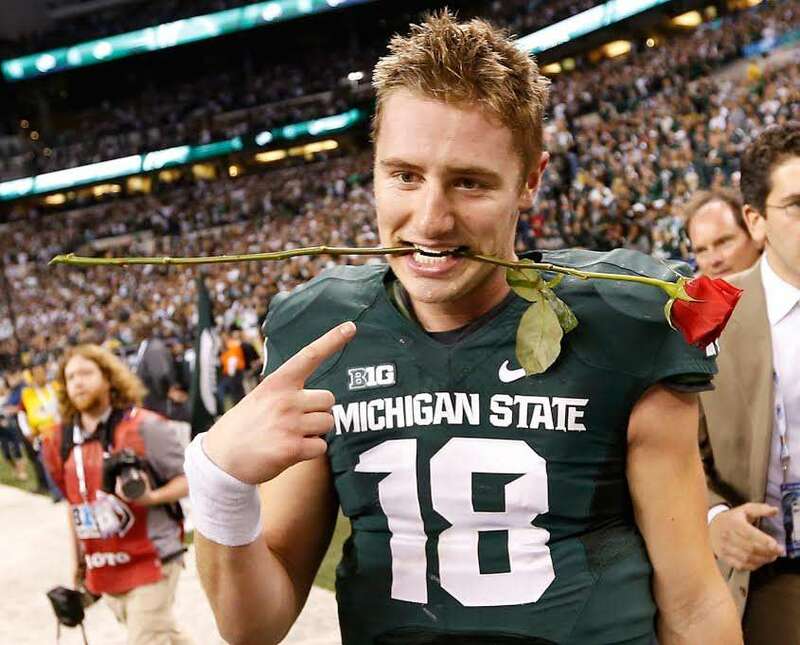 Forget the rose, Cook’s hair looks like the best stylists in Los Angeles scrambled to the Rose Bowl to style and place every strand as he celebrated his big win for the Spartans. Cook’s hair embraces that spiked look that’s even sharper than the thorns on a rose. Speaking of — if the Michigan State QB keeps throwing footballs as well as he throws-up his hairstyle — the Spartans should be back in the Rose Bowl in a few short months. 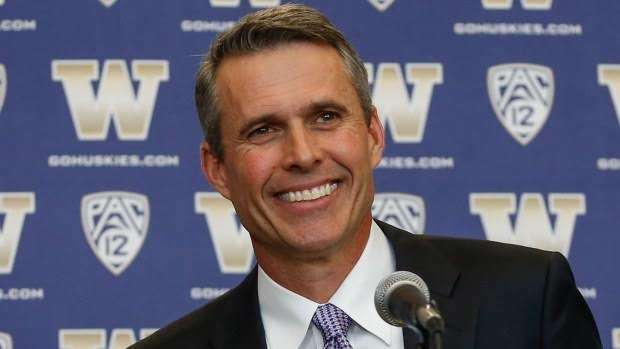 In only his second season with the Huskies, Chris Petersen just scored a big win — a HAIRRY! 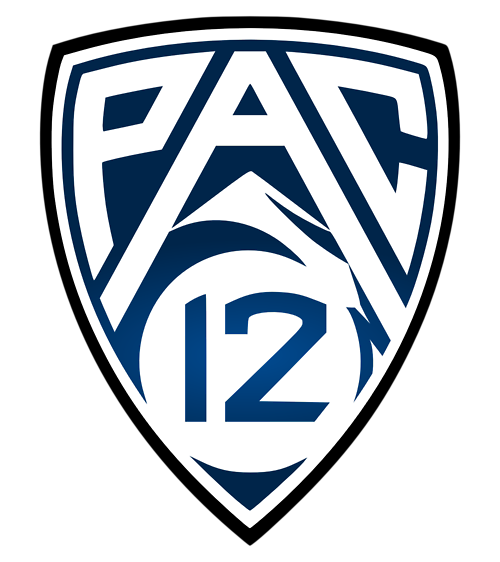 When asked about his win at a press conference, Peterson acknowledged his competition, “This is a really, really, hard, good conference.” Okay… he may have actually been talking about the quality of football teams in the Pac-12, but we know he also appreciates the competition for good hair on the West Coast. Washington should consider itself lucky to have such a handsome head of hair roaming its sidelines. 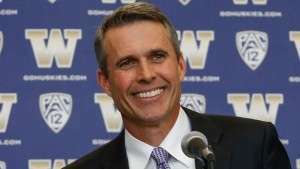 Petersen has just the slightest bit of gray with no signs of thinning or receding. He also keeps it simple but just a little spunky in the front. Bravo, Mr. Petersen, you’re off to a strong start! Los Angeles is known as the land of good-looks and good-looking hair. Cody Kessler proudly carries that torch for the Trojans. This stud quarterback somehow manages to keep his hair looking perfect no matter whether he’s been fighting a Pac-12 opponent or fighting a hot California afternoon. 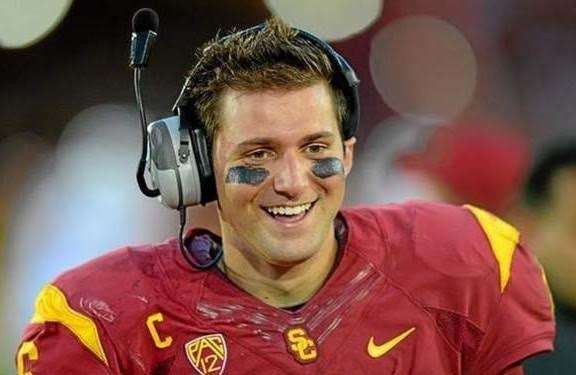 Understanding that he plays QB in Los Angeles, Kessler always keeps his hair camera-ready. The USC star never knows when the cameras will take a close-up, so as soon as his helmet comes off, his hair takes the stage. Cody keeps it cut in a way that one quick run of his hand through his hair means he’s good to go! When asked about Kessler earning one of the coveted HAIRRYs from the Pac-12, USC’s head coach Steve Sarkisian said, “I don’t know what more we could really ask of the guy.” Fine, he may have been talking about Cody’s performance last Saturday, but we’ll just pretend he was talking about his hair. 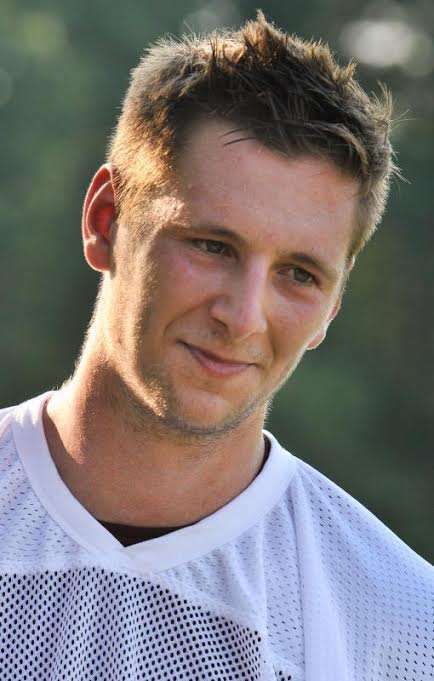 Oh, and Kessler’s smile is the reason rainbows happen. Classic but fresh. 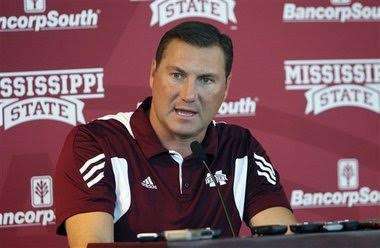 That’s how we’d describe Mississippi State’s Head head of hair. Mullen knows how to make a clean part, keeping it all tidy and in-order on top. Maybe his hair styling is modeled after his football team? Mullen sure took a rag-tag bunch of players and turned them into a tidy Top 25 powerhouse, winning 10 games last season! We hope to see even more wins from Mullen this season — and more of his hair! Please, Dan, don’t use your half-hat to hide such a handsome head of hair. Golden! Our HAIRRYs come with a beautiful golden seal, and so does Maty Mauk. We love this picture of his hair, because it shows off Maty’s nice auburn tones — which are natural, of course. He even complemented his suave hair with a golden bowtie. Nice touch. For all of you partial football fans, please don’t confuse Maty Mauk with Matt Mauck formerly of LSU. Matt (without a ‘y’) can’t compete with Maty in the game of hair greatness. Matt simply pulls it back, settles it into place, and lets it shine! That’s a nice strategy for hair — we know very little about football, but maybe it’s a good strategy for football too? 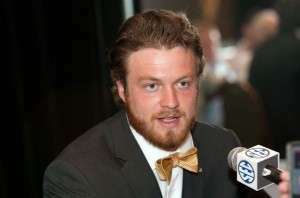 Regardless, Maty Mauk carries the crown of the greatest QB hair in the greatest football conference — the SEC! Why did the Pope just make his first visit to the United States? Because he hoped to catch a glimpse of Bob Diaco’s hair in-person. Why did the stock market plunge in August? 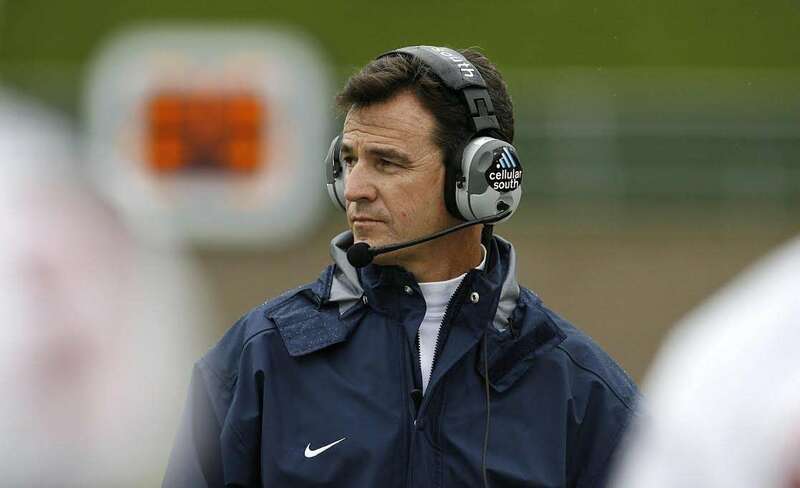 Because it had gone too long without seeing Bob Diaco’s hair on the sidelines for UConn. You know that’s true, because stocks rebounded in conjunction with the return of Diaco to the football field. Our economy thanks you, Mr. Diaco. It’s hard for us to decide what we love most about these deep brown locks. Is it the thickness? Sure. Is it the perfect wave to the side? Yes. 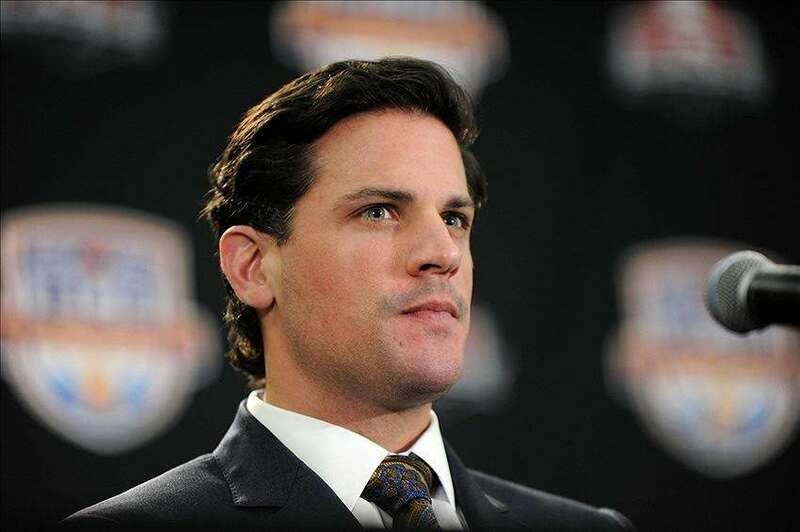 Is it the natural color which perfectly complements Diaco’s smoldering gray eyes? Yes, that too. Maybe what we love most is — all of that. 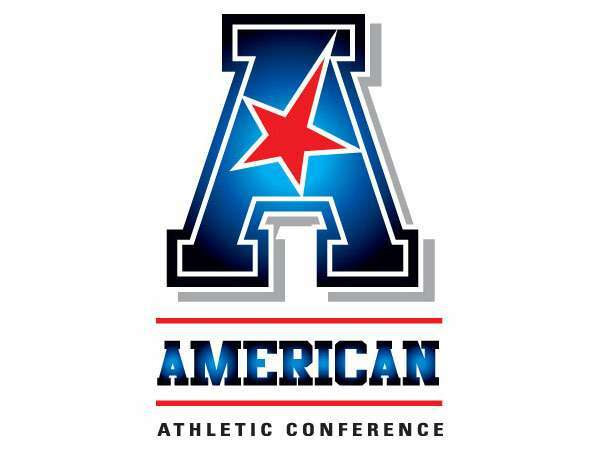 The American Athletic Conference may compete for wins on the field, but when it comes to hair — the competition couldn’t even score a single point against Bob Diaco. This guy doesn’t need Nioxin! “Tulane’s Tanner Tops on Top!” That will be the headline in tomorrow’s edition of the New Orleans Picayune. Tanner Lee’s hair is big news in the Big Easy. It’s also just big, and we love it. Tanner seems to have mastered the college-student-doesnt-care-but-his-hair-looks-great-anyway look. And that’s one of the toughest looks to master. Tanner, will you share your winning secrets with us? Will you tell us what you call your hair? Is it inspired by the Green Wave? Who do you allow to touch such perfect hair? What do ladies call your hair? We have so many questions, Tanner, tell us! One thing we do know for sure is that Tanner’s hair will be the grand marshal in a Mardi Gras parade next year. Laissez les bon temps rouler, and laissez – that beautiful hair stand tall! 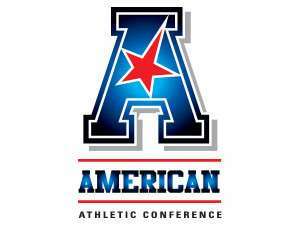 Conference USA may be known for lots of things, but we can assure you it’s not known for its great hair. 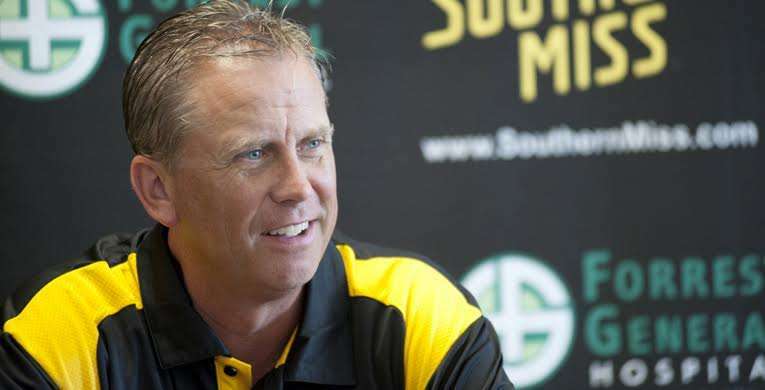 That’s why we were so thrilled to find Todd Monken! Todd embraces what he’s got and he works it to the fullest. We wonder if this picture came immediately following a thunderstorm — or maybe just a Gatorade shower? Either way, Coach Todd (can we call you Coach Todd?) knew exactly what to do! 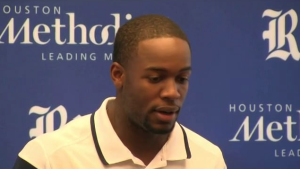 He ran his hand through his hair in just the right way to be ready for the post-game press conference. Talk about strong leadership! We imagine Driphus being a gentleman who takes time looking good for every occasion. At least that’s what his hair says to us. Rice’s QB evidently takes time to make sure he’s sharp on the field — and on top. Look at those sharp corners above his forehead and perfectly faded sideburns. Bravo, Driphus! We should mention that Rice’s head coach even credits a recent win to his quarterback’s hair, “Driphus got his momentum and… we all started a really good brand of football.” Wow! Just from his sharp hair? That’s amazing — even if we may have taken that quote out of context. But who cares? Driphus Jackson only cares that he’s the winner of Conference USA’s QB HAIRRY! FOX Sports just wrote the headline: “Bowling Green’s Babers has the ‘stuff’ for success — and it’s coveted.” We’ll let you in on a secret. We know why they wrote that — because of Dino’s hair! 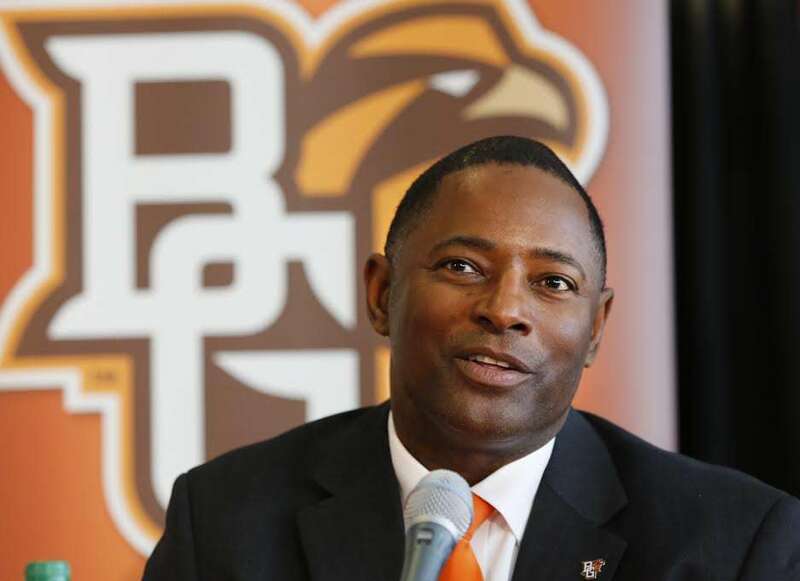 This head coach for Bowling Green (Ohio, not Kentucky) knows that looking good counts for half the battle. The other half of the battle is… football? We’re not sure. We’re hair experts, but we are sure that Coach Babers visits his barber regularly and knows what he likes. He also imagine Bowling Green loves having a coach who knows how to keep his appearance ON. POINT. The only thing about this HAIRRY Award-winning quarterback that we love as much as his hair is his name! Brogan William Roback? That sounds like royalty! Brogan, are you a king? Oh. Right! You’re the “King of Hair” for the MAC! While you’re traveling the country showing other quarterbacks how it’s done, you can also show them how you style your hair. We’re sure they’ll gladly accept your advice. After being informed of his runner-up finish in the HAIRRYs, UMass’s quarterback revealed his secret to consistently flawless hair, “We have to do it the same way no matter who we are playing, whether it’s Penn State or Notre Dame, no matter who it is. You can’t change the routine.” [Confession: Blake was talking about football, not his hair.] But we’re sure his sentiments also apply to his style routine. Frohnapfel ignores his opponent and just focuses on plucking those brown strands in to place the same way every morning, and why not!? He’s doing a great job! Blake’s hair follows the trend of shorter on the sides with a little more length on top. It’s a good look for him and one he masters no matter his surroundings. We found pictures of Blake looking sharp after a long practice, a challenging game, and even during interviews with the media. This QB has the hair for all occasions, and we salute it! 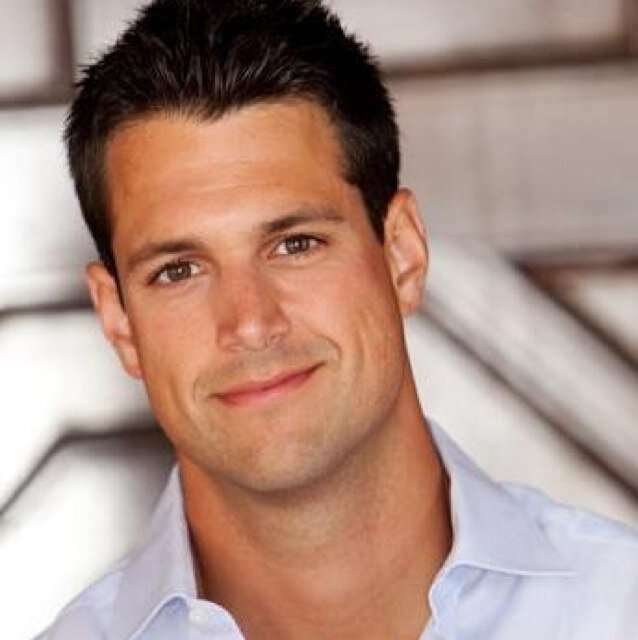 In the South, guys refer to this type of cut as a “frat shag.” It also reminds us of a previous HAIRRY Award runner-up, Cuthbert Langley from NC5 in Nashville. But in the case of Ron Caragher, we’re stumped! He’s not in a fraternity (that we’re aware of), and he’s not in the South. So what can we rename Caragher’s cut? Wait… that’s it! The “Caragher Cut.” Congratulations, sir, you aren’t just the winner of a HAIRRY, you’re also the namesake of a hairstyle! That’s how you know you’ve made it. 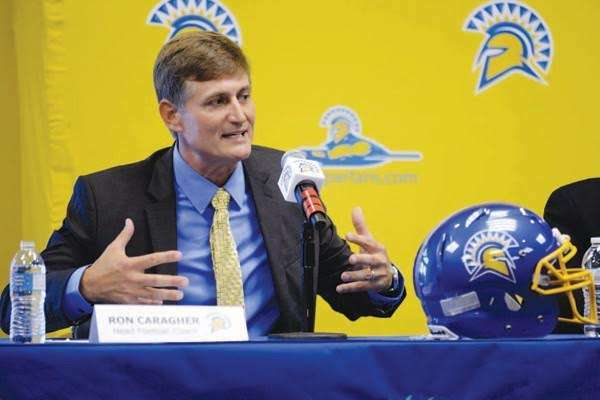 We do admire Coach Caragher’s ability to have a full head of hair after the age of 30.. 40? 50? We don’t know how old he is, but it doesn’t matter. He’s letting just a few natural gray hairs sneak in, probably, because he’s so confident in his manly “Caragher Cut.” Coach, you inspire boys to become men, players to excel, and guys everywhere to have good hair. In West Mesquite, Texas born and raised… on a playground is where he spent most of his days. Chillin’ out max and relaxin’ all cool… and all throwin’ some footballs outside of the school. When a couple of guys, they were actin’ no good.. started gettin’ jealous of how his hair stood! …and we can’t blame those guys for being jealous. If you haven’t already caught on — Chason Virgil must take his hair-spiration from the Fresh Prince! Is Chason old enough to know who the Fresh Prince is? We sure hope so, because we love Will Smith and that show. We also love how Chason is taking it back with this style. It shows confidence, taste, and requires skill — much like his ability for leading Fresno State on the field. Eric Taylor, is that you? Remember him? The football coach from “Friday Night Lights!” Fine, Coach Taylor is fictional, but the actor Kyle Chandler is not …and neither is Joey Jones! The head coach for South Alabama has real-life, amazing hair. It even looks good under a headset! And isn’t that requirement #1 for a football coach to have good hair? Must look good under headset… Check! Coach Jones, we applaud your hair for its classic, simple style. It’s got volume, the right amount of product, and no signs of retreat. And that’s what you want in a good line for hair (and the offense) — no sign of retreat! Congratulations on this HAIRRY, Coach Jones. 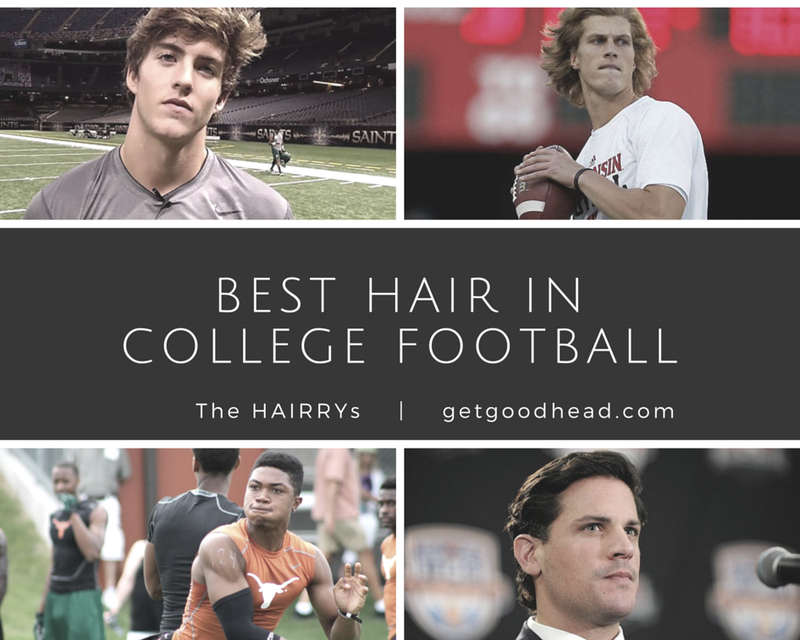 You may not have the paycheck of Nick Saban or Guz Malzahn — but you’ve got waaayyyy better hair! Everyone can’t wait to high-five BYU’s quarterback Tanner Mangum, but it’s not because of his skills on the field. Nope. It’s because they’re all so jealous of his brunet hair! Mangum is a good Mormon boy, having spent time as a missionary in Chile before getting back to business on the field. We can’t readily think of a Chilean with great hair, but maybe that’s where Tanner picked-up his style tips? Along with sharing the gospel, did Tanner also take classes in hair styling while traveling abroad? Hmm. We’ll look in to that. While we investigate the source of Tanner’s top-notch hair, you can just celebrate its beauty. It’s a simple cut with the right amount of length on top. That seems to work well for QBs who may have to pull off their helmet at any moment and still look good for the cameras. Tanner seems to fit that bill well, and the people of Utah are lucky to have such a beautiful head of hair to gaze upon every time BYU’s defense is on the field. 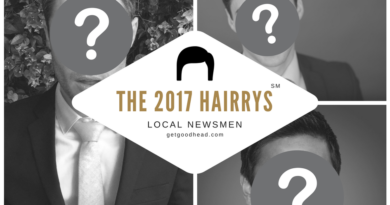 You can read about our other HAIRRY-Awards here!